At the beginning of September I attended a course in Pembrokeshire on rocky shore invertebrates. The course was carefully timed to coincide with the largest ‘spring’ tide of the year so that we could explore the furthest point of the lower shore. The term ‘spring tide’ has actually no connection with the season but is derived from the Saxon ‘springan’, “to bulge” or “to rise”. The dictionary definition is “the rising of the sea (to an exceptional height) at particular times” (Onions, 1952). These “exceptional” tides are caused by the combined gravitational effect of the sun & moon every two weeks at a new and full moon. The largest ‘spring’ tide occurs near the equinox during September when the sun and moon are most closely aligned and so referred to as an “equinoctial spring tide” (Oakley 2010). A similar tide occurs around the March equinox. This is therefore a very special time for the seashore naturalist, when animals and plants are so rarely exposed for observation. 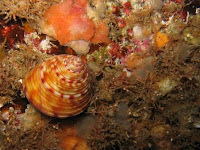 On my visits to rocky shores near Dale Fort, large kelp forests were exposed dotted with Blue-rayed Limpets (Patella pellucidum); small flattened versions of the Common Limpet (Patella vulgata) found high up the shore and characterised by brilliant iridescent kingfisher blue lines across their dorsal surface. Painted Topshells (Caliostoma zizphinum), the most colourful of this group of sea snails looking like vibrant spinning tops were found amongst amid rocks encrusted with brightly coloured star ascidian colonies, looking as alien as their name suggests . 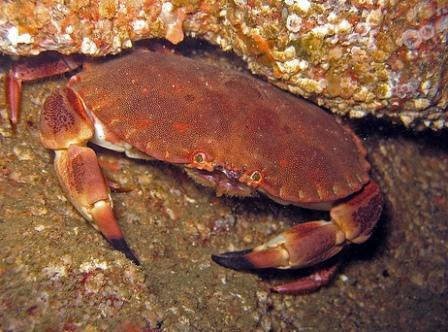 Crabs were also revealed, more typical of sub-littoral habitats (below shore level), such as the pie-crust edged Edible Crab (Cancer pagurus) and dirty looking Broad-clawed porcelain crabs (Porcellana platycheles). Most exciting was a Decorator crab (Macropodia sp) covered in little seaweed tufts in an attempt to camouflage itself, and a small skeleton like sea-spider scuttling along the tide line at its lowest point. It was a fantastic opportunity to capture a rare glimpse of such wildlife, but all too soon the tide turned and they became submerged again beneath the advancing waves, some not to be exposed again for perhaps many months. Why not book your place soon for the next equinoctial spring tide at a rocky shore near you! Onions, C.T (Ed) (1952) The shorter Oxford English dictionary on historical principles. 3rd ed. Oxford: Oxford University Press.